If there were awards for great titles, then Bullet Ballet would surely be up for a gong or two. Neatly suggesting a blend of violence and elegance, it sounds like the perfect Hong Kong era John Woo film, an all-action but balletic explosion of the slow-motion gunplay that became the director's trademark. But this isn't John Woo, this is Tsukamoto Shinya, a director whose deeply personal style is a million miles from Woo's slickly assembled action works. Tsukamoto's concerns are far more localised, to the city in which he lives, to his own neighbourhood and even his own body, and his cinematic style is far edgier and more dangerous. Which is not to knock Woo in any way, but at a time when Woo is making vacuous nonsense like Paycheck, Tsukamoto is making A Snake of June. He is one of those rare directors who has never sold out and never compromised his vision. Tsukamoto is the very personification of a great outsider film-maker. For a while, a great title is all Bullet Ballet was, at least in the UK. After the cult international success of Tuskamoto's breakthrough Tetsuo films, British distributors all but turned their back on the director, and tracking down his work has proved a task and a half over the years, especially for someone not located near a big city and its independent cinemas. Tokyo Fist eventually made it out on video, a good friend in Japan sent me both Soseiji and A Snake of June on DVD, but Bullet Ballet proved insanely elusive. As if the title wasn't mouth-watering enough, I kept hearing the likes of Mark Kermode going on about how great it was, all of which was driving me slowly potty. Finally I tracked down a non-anamorphic DVD with English subtitles from Chinese distributor Fejui and the film proved to be everything I'd hoped. But this disk played odd games with my DVD player/TV combination and, like Manga's recent UK release of Tokyo Fist, was far from ideal. Which is where, seven years after the film first appeared, Arts Magic step in. Well, sort of. In some ways Bullet Ballet is a companion piece to Tokyo Fist, which immediately preceded it. In both films Tsukamoto himself plays a faceless salaryman (his character here, Goda, is strikingly similar to Tsuda in Tokyo Fist) whose girlfriend leaves him of her own accord early in the story. While in the earlier film she deserts him for a boxer whose vicious physicality she is attracted to, in Bullet Ballet she kills herself with a handgun. 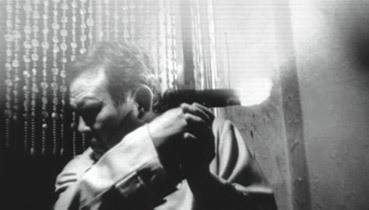 In both films the response of Tsukamoto's character is to embrace the source of the violence in an effort to comprehend and somehow rectify what has happened – Tsuda takes up boxing to confront the man who has stolen his girl, while Goda goes in search of a the exact same handgun that his girlfriend turned on herself in order to similarly confront his own incomprehension and despair. But chance intervenes in the shape of Chisato, a girl he believes he has saved from being hit by a train (we later discover that the danger she appeared to be in was part of a risk game she and her cohorts play), an encounter that ends in him being beaten senseless by the rest of her gang, a scene that mirrors the pounding Tusda takes in Tokyo Fist when he confronts the boxer. Having had no success in tracking down the gun, Goda constructs one of his own and returns to take on his attackers, but the gun misfires and he takes a further pounding. Finally he tracks down the weapon for which he has been searching and becomes furnished with a purpose. Following a further abortive attempt to take on the gang, his fate becomes linked with theirs, and specifically Chisato, after she and her friends are targeted for death following a gang war killing of – yes – a boxer. At this point it almost feels as if the narratives of the two films have briefly intersected. 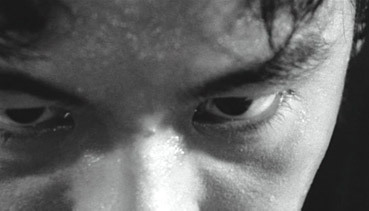 Pretty much all of Tsukamoto's favourite themes are present here, the most prominent being the deadening effect of the corporate world and the need to violently escape it in order to find your real self and experience genuine emotion – as with Tokyo Fist and Marina de Van's recent Dans ma peau, this is achieved through the experience of physical pain and the destruction of the body. The film also shares with David Lynch's Blue Velvet a fascination with the darker substructure of everyday society (first triggered here metaphorically, as it was in Tokyo Fist, when the lead character catches sight of a dead animal in an alleyway), whose representatives here are the group of drug-addicted young wannabe gangsters that Goda confronts and eventually sides with. Central to this journey through the Tokyo underworld is Goda's relationship with the gun he is desperately trying to buy, which becomes a link to his lost love (he tries to understand why she killed herself by recreating the physical conditions of her death), an instrument of revenge for the beating he has taken, a club to physically punish himself with, a bargaining tool used by Chisato to enlist his help, and a prop to restore an abstract notion of manhood that has become drained from a society in which men once were warriors. There are a few direct references to Taxi Driver (one of Tsukamoto's favourite films), but anyone expecting the sort of cathartic bloodbath that climaxed Scorsese's masterpiece is in for a surprise – a final confrontation does take place and guns are fired, but despite his determination to be something more than he is, Goda is no warrior and almost nothing about this extraordinary scene plays out how movies have led us to expect. 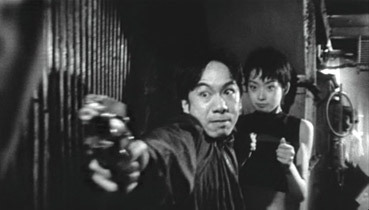 Although it immediately followed Tokyo Fist, stylistically Bullet Ballet represents the most obvious transition from the anarchic sensibilities of Tetsuo to the more formally composed beauty of Sôseiji, it's high grain black-and-white photography, twitchy long-lens camerawork and sometimes ferocious editing (the sequence in which Goda creates, perhaps in his mind, a montage of increasingly destructive gunshots to a metal techno beat is a genuinely stunning slice of kinetic cinema) recall the director's notorious debut, but the subtextual complexity is very much that of a man who has mastered his craft and is exploring new directions in which to take it, while at the same time staying true to and expanding on his chosen themes. Although similarly dark in tone to Tokyo Fist, Bullet Ballet is ultimately a more optimistic film (Tsukamoto himself regards it as one of his more anxiety-ridden works). The city still exerts a power strong enough to distort image on screen, and physical suffering is still seen as an inevitable part of awakening from the corporate daze, but here Tsukamoto offers hope in the shape of the light and space Goda draws strength from before battle and later flees hungrily into, liberated and transformed by his experience. As are we. Bullet Ballet is in the very best sense typical Tsukamoto – charged, confrontational, rule-breaking and at times electrifying. It's a film that drags you mercilessly into the darkness before spitting you back out into an uncertain but inexplicably thrilling light. Though shot on 35mm, Tsukamoto has elected to use high speed black-and-white stock that produces a grainy, rough-edged image that may not look pristine on DVD but most definitely suits the film. Framed at 1.85:1, the transfer is something of a mixed blessing – it scores heavily over the Fejui disk by virtue of its anamorphic enhancement and a decent level of sharpness (within the restrictions of the original material), but the contrast levels vary quite a bit, with strong black levels in some shots giving way to grays in others. The contrast may be a little heavy on the Fejui disk, but it is consistent and blacks are blacks there. There are two sound mixes on offer, Dolby 2.0 stereo and 5.1 surround. Though the full sound stage is not really put to use (despite some whisperings in the rear speakers during city exteriors), the 5.1 track definitely has a fuller and richer feel. Subwoofer activity is surprisingly low. One of the two principal extra features here must be the commentary by Tom Mes, asian cinema expert and author of the upcoming Iron Man – The Cinema of Shinya Tsukamoto. A gentle talker, Mes largely refrains from interpreting the subtextual elements of the film to concentrate on some very solid background and technical details, outlining the social element of the locations, how key scenes were shot and informing us that though the film looks as if it was shot guerilla style, permission was actually obtained for the vast majority of filming. He also reveals that Tsukamoto chose to make this in black and white so that it would have the steely gray look of a gun, and that the film was inspired by a true incident when Tsukamoto himself was assaulted by a gang near his office. Interview with director (34:34) is shot on video and framed 4:3 (with Tsukamoto's head sitting dead centre in frame, what we used to call 'gunsight photography') and chaptered by a series of very good on-screen questions. Tsukamoto talks in detail about a variety of aspects of the film and his career, including shooting hand-held and giving the film a deliberately documentary feel, the influence of the photographs of Larry Clark, the interaction of the city and the human body, the (by Japanese standards) luxurious four month shooting schedule, and film's social and thematic aspects. This is all very interesting stuff, and runs for a good length. Bio/filmographies are provided for director Tsukamoto and actors Igawa Hisashi, Mano Kirina and Suzuki Kyoka. Tsukamoto's is very detailed, the others are extraordinarily brief – although listing all of his films, Suzuki's biography has been whittled down to "Born on 31st May 1968 in Sendai." Promotional material consists of a single screen featuring the cover and inset of the programme notes containing all of the film's credits. Trailers has two short Japanese trailers for the film. They are identical save for a selection of critical quotes that precede Trailer 2. As trailers go, this captures the energy and feel of the film very well. Unusually but pleasingly, both have removable English subtitles. A terrific Tsukamoto Shinya study of the interaction between the city and the human body gets pretty decent treatment by Arts Magic, with an anamorphic transfer, an informative commentary track and a consistently interesting interview with the director to recommend it. A shame about the contrast on the transfer, though – this jumps about quite a bit and lets an otherwise strong disc down just a tad. But this will do for now, and I'd still give it the edge over Manga's Tokyo Fist disk on the basic of the anamorphic picture and the extras, and it's a seriously impressive slice of on-edge cinema that has been too-long unavailable.